How to name the Excel worksheet when an SSRS 2008R2 report is exported into an Excel format? If a report that has many graphs and tablix, when the report is exported to an Excel format, each worksheet name is defaulted to “Sheet1”, “Sheet2” and so on. 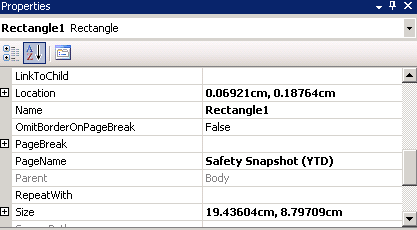 To name the worksheet to the name of the graph or tablix or a rectangle, set its PageName attribute to its name or a dataset field using an Expression. Apparently this only works for 2000R2.